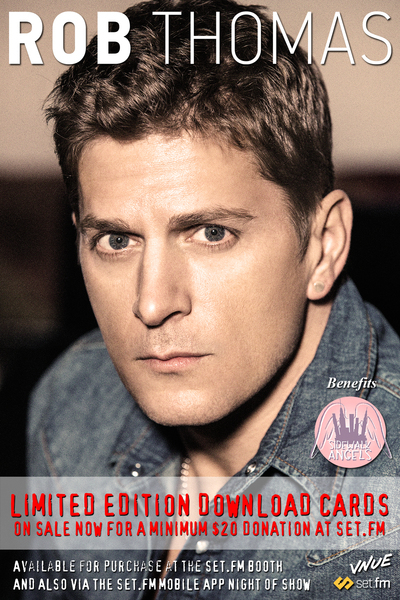 VNUE, Inc. (OTC: VNUE), announced today that it is working with international superstar and Grammy-winner Rob Thomas to record several shows in January and make the content available for download immediately after each show via VNUE’s set.fm as well as partner PledgeMusic.com. Thomas is set to perform three sold out shows at Atlantic City’s Borgata Casino Music Box, January 12-14th, and VNUE will be there to capture and professionally produce every note. This will be the seventh consecutive year that Thomas has held the shows at the Music Box benefitting his Sidewalk Angels Foundation. Sidewalk Angels Foundation, founded by Thomas’ wife Marisol, is dedicated to providing critically needed funds and support to over 20 no-kill animal shelters and animal rescues across the country, that “help to fight for the rights and fair treatment of those with no voice.” Proceeds from each and every sale will directly benefit Sidewalk Angels.